Smuggling in a fraught, mythic tale of destiny and blood ties under the old-fashioned clothing of a ’70s-style crime drama, writer/director James Gray‘s first film in seven years broods with dark, tantalising subtleties. 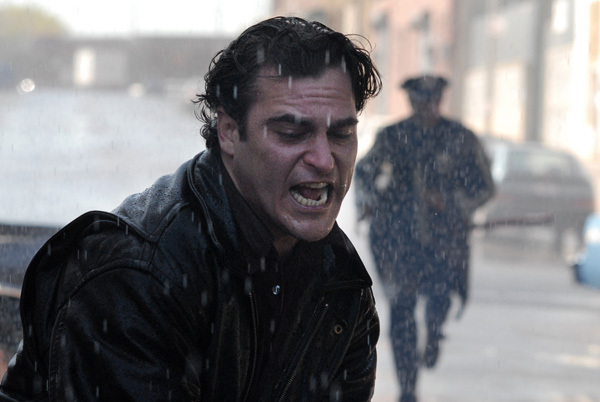 Trapped again and again in God’s-eye cut-backs and stretched takes, coked-up nightclub manager Joaquin Phoenix finds himself driven to reunite with his estranged cop family (Mark Wahlberg as his brother, Robert Duvall as his deputy-chief dad) in the late-’80s NYC drug war. But Grey shapes his classical framework too close to contrivance and convention too often, leaving his intriguing thematic payload lost in murky, indistinct drama. Eva Mendes completes a volley of evolving, insular performances that mesh perfectly with the fading shadows and ambient noise of Gray’s sombre neo-noir stylings. Yet still, for all the heat, the slow-burn simply never ignites. Shame, because Gray was achingly close to something here. A desperate violence and urgency spills out in the film’s flash-point set-pieces – not least the sensational car chase, shot through a windscreen, hammering rain and a blur of fear.